When David saw that King Saul was bent on discouraging him from confronting Goliath, he decided that he’d better give him a short testimony. David said to Saul, “Your servant has been keeping his father’s sheep. When a lion or a bear came and carried off a sheep from the flock, I went after it, struck it and rescued the sheep from its mouth. When it turned on me, I seized it by its hair, struck it and killed it. Your servant has killed both the lion and the bear; this uncircumcised Philistine will be like one of them, because he has defied the armies of the living God” (1 Samuel 17:34-36). The ability to recall the past is one of the most powerful functions of the brain. It can be both a blessing and curse, depending on what you choose to recall. Remembering brings the emotions of the past into the “now” whether the event was positive or negative. When you recall positive experiences, you rekindle the courage, the joy, and the sense of accomplishment associated with the victory. You can never underestimate the power of an experience to re-inspire faith. Several years ago when I served as Chief Financial Officer for a mega-church, I negotiated an unprecedented financing commitment for the construction of the church sanctuary. It was exhilarating and a bit scary. I remember feeling inadequate from time to time as I met with the highly sophisticated bankers. The deal terms were very complicated and I was concerned that I would make a misstep that would prove detrimental to the church. However, my anxiety was short-lived and my confidence was bolstered each time I recalled that several years earlier, I had taken a job in an industry in which I had absolutely no experience. God had shown Himself strong and had allowed me to develop a reputation for being a great negotiator as well as being able to project future expenses with a high degree of accuracy. Because I was so unfamiliar with the complicated operations, I knew beyond a shadow of a doubt that God had worked on my behalf. It was a very humbling experience. 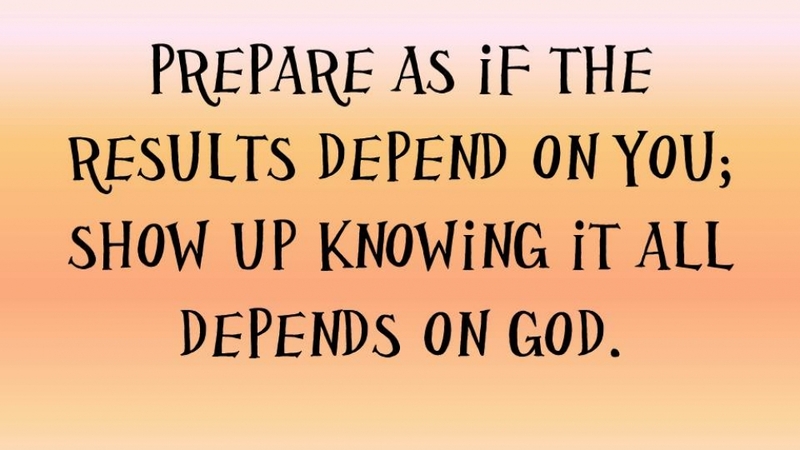 It was then and there that I learned to just show up as prepared as I could be, but to expect the real answers, the brilliant stuff, to come from God. If you have allowed Satan to give you “experience amnesia” and have forgotten those times of divine intervention in your life, why not recall someone else’s testimony? Faith can come from more than one direction. Read the miracles recorded in the Scriptures. Recall the good things God has done for your friends, acquaintances, coworkers, and even people you have heard about on the news. Miracles are faith-building no matter who the recipient is. If He did it then, He can do it again. So here is my challenge to you. If you are facing a situation where you are feeling inadequate for the task, recall a time or incident in which God brought you out of a difficult situation. Do you believe that God is the same yesterday, today, and forever? Then just show up my friend and get ready to give Him all the glory.